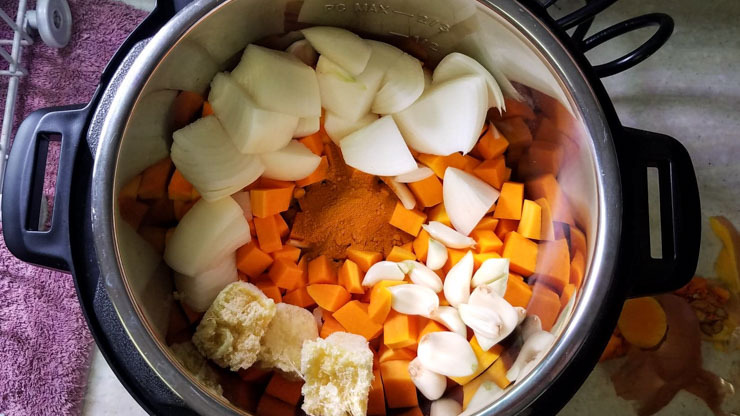 Instant Pot Winter Cold Squash Soup - All Vegetables! 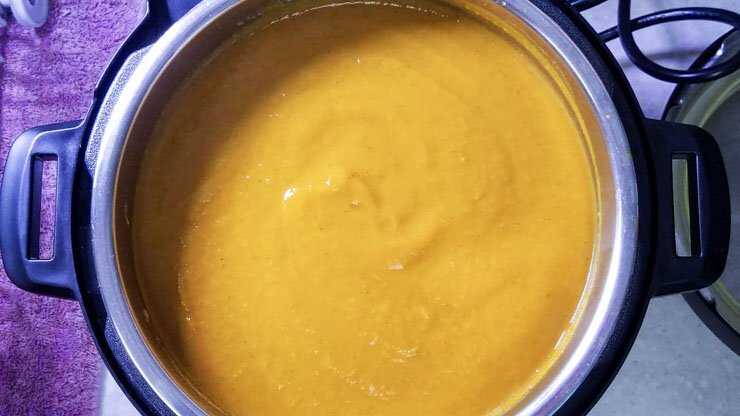 READER SUBMITTED RECIPE: This Instant Pot Winter Cold Squash Soup was submitted by reader Julie Bower. 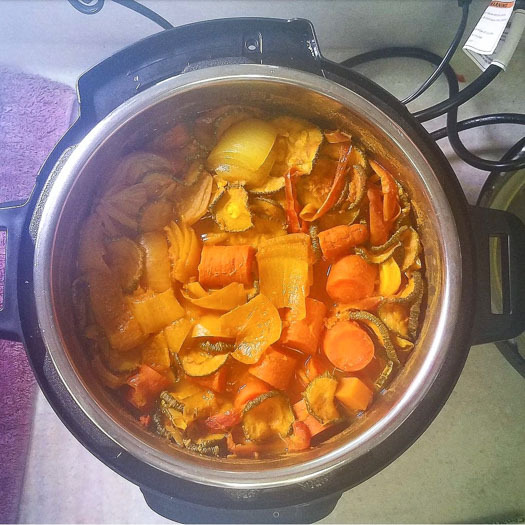 This soup is called Instant Pot Winter Cold Squash Soup because it has lots of Tumeric and Ginger. It’s a hearty soup that you can enjoy for cold weather, and especially if you are not feeling great due to a cold or those pesky allergies this time of year! 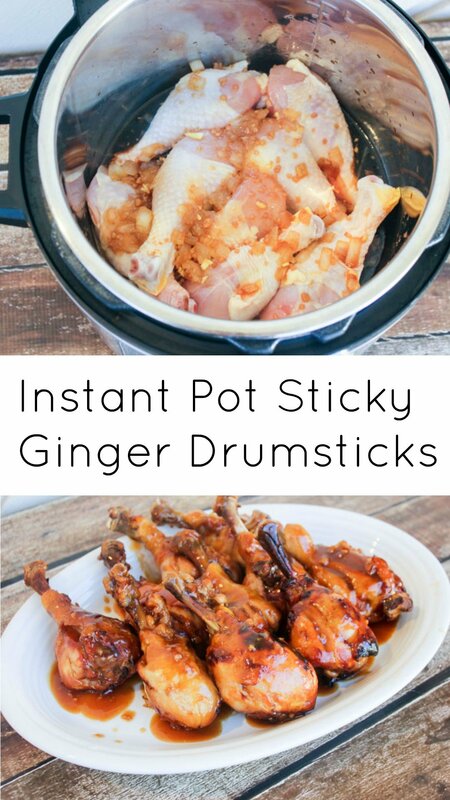 This recipe comes together in a snap in the Instant Pot! See recipe below. I love any plant based recipe. If you are trying to watch calories and salt, one thing that is probably NOT on your daily menu is a meat dish. This soup is great since it has hearty squash and garlic and you won’t miss not having a meat for your main dish. 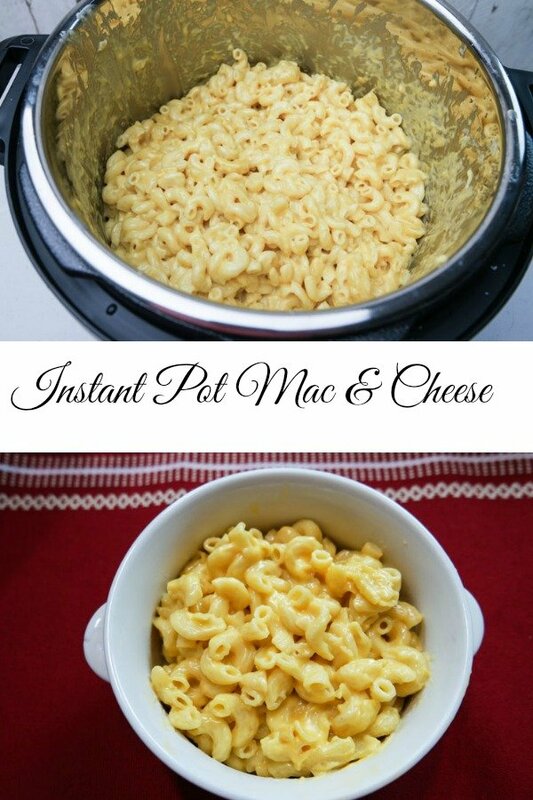 You can also make it your own by adding other veggies you have in the fridge. Carrots, celery and even small diced potatoes won’t change this soup much at all. 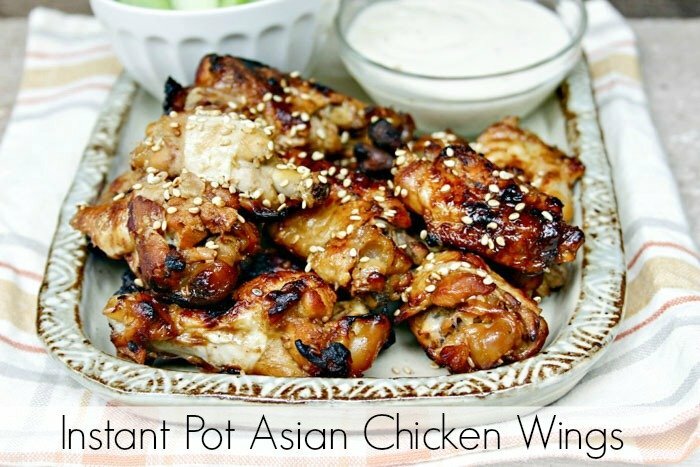 So clean out the fridge and pantry with this recipe!! I ended up actually adding some frozen veggies including zucchini and peppers, along with carrots from the fridge and the vegetables the soup calls for in the recipe. Again, clean out that freezer or fridge and get your serving of vegetables in! 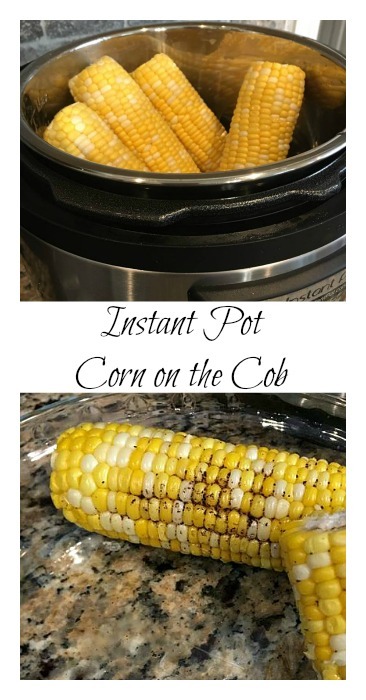 The Instant Pot will cook down your vegetables into this, pictured above. The veggies will be soft but still roughly chopped. At this point, you will need an immersion blender to puree the soup. I honestly do not recommend a hand mixer, since those tend to splatter and this soup will still be super hot! Be safe and do not burn yourself while blending this soup! You can find a good Immersion Blender here, and although you may not be using it all the time, it does serve a very specific purpose in the kitchen and you will get use out of it. It pureed this soup beautifully. See below! This soup is for when you're just not feeling great, it's so hearty and perfect for those with colds and allergies that go around in the winter. 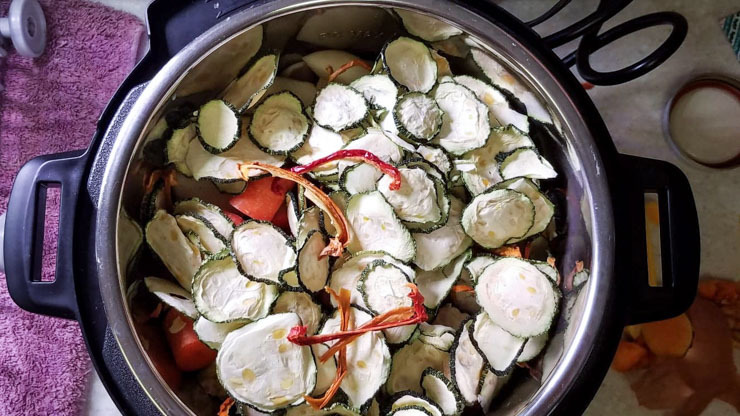 Chop all vegetables and add into Instant Pot, mix lightly. Add Vegetable Stock and Spices. Vegetable stock must cover vegetables, so add additional water if necessary. 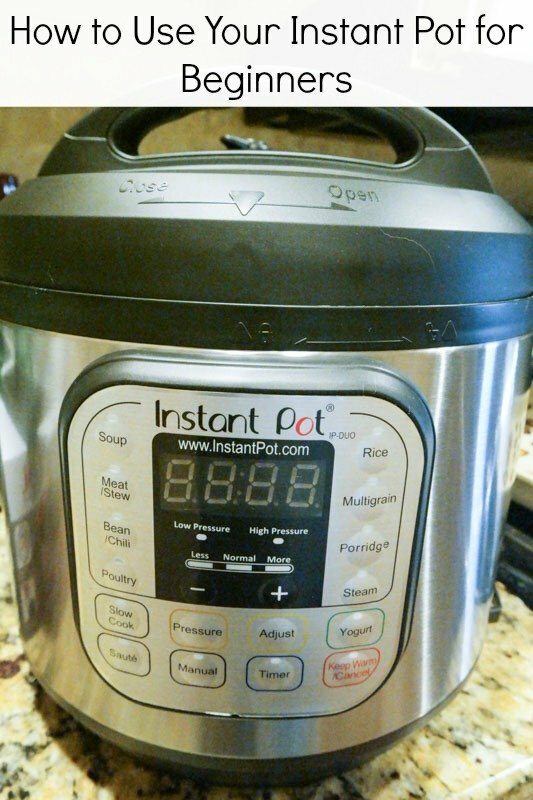 Set Instant Pot to Manual for 10 minutes. Release Instant Pot Pressure by Natural Pressure Release, but Manual Pressure Release is Optional. Puree with Immersion Blender, Until close to smooth. Thin with additional water if needed, in 1 TBSP increments. This soup has some real kick, from the ginger, hot Mongolian Fire Oil, and garlic. That zip is great for when you are hungry but just not feeling up to a full meal and need something for a good pick me up! Enjoy!